It's the full-size R/C truck we've been dreaming of. In 1985, Japan’s Tamiya Corporation introduced the radio-controlled Toyota Bruiser. With a three-speed gearbox, a four-wheel-drive system, and even a leaf spring suspension, it was the ultimate off-road toy for kids of all ages. In honor of that legendary R/C truck, Toyota U.K. has unveiled a full-sized Toyota Hilux to match. Dubbed the Toyota Hilux Bruiser, the one-off truck was built by specialists at Arctic Trucks, and looks nearly identical to the toy. Based on the Hilux Extra Cab model, the custom creation comes with an Arctic Trucks AT35 conversion, which includes larger 35-inch tires, a modified suspension, new gear ratios, and larger flared wheel arches. The wheels are finished in a distinctive chrome finish to match the original model, and the bodywork has been wrapped in a high-metallic Diamond Blue vinyl finish, done by the team at Funkee Fish. The "Hog Heaven" livery on the door panels, and decals located on the side sills and bed have even been replicated. Other notable features include a louvered rear window wrap, just like the original R/C car, a white bull bar with matching stripes, and a blacked-out grille. Under the hood is a 148-horsepower (110-kilowatts) four-cylinder diesel engine, which sends power to all four wheels via a six-speed manual transmission. "While Hilux is all about capability, owners and all fans of pick-ups and big trucks know a big part of the experience is also about having fun," said James Clark, Toyota GB Press Relations Manager, "In that spirit, we wanted to do something truly original to celebrate the latest Hilux and carry forward the great relationship we have with Tamiya." 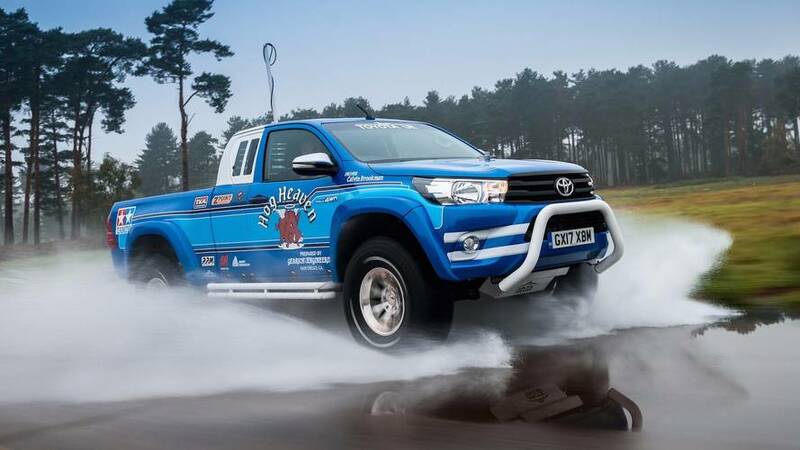 The Toyota Hilux Bruiser won’t be available to buy, sadly, but the company says that it will be used extensively at media appearances and events around the U.K. If you’re interested in owing the original R/C car, though, you can pick it up from Tamiya America for a cool $1,328. For all its toughness, there’s a playful element to the Toyota Hilux that can put a smile on any driver’s face, a big-toy appeal that’s lasted through generations of the world-beating pick-up. Tamiya celebrated this quality when it produced its hugely popular radio-controlled scale model version back in the 1980s. Now Toyota is returning the compliment with its own, custom-built working replica of this miniature hero – the Hilux Bruiser. The big difference – and we mean big – is that this is a full-size machine that’s kitted out for the extremes of off-road driving, courtesy of conversion specialists Arctic Trucks – the team that built the Arctic-conquering Polar Hilux. The new Hilux Bruiser makes its debut today (alongside its Tamiya model inspiration) in a new short film released on Toyota’s official UK YouTube channel and available to view below. The Hilux Bruiser – strictly a one-off – is based on the new Hilux Extra Cab model. To scale-up the original model’s big-wheeled look, Arctic Trucks installed its AT35 conversion, fitting wheels with massive 35-inch tyres. This called for engineering changes, too, with modified, up-rated suspension, new gear ratios in the differential and flared wheel arches. The wheels themselves have been given a chromed finish to match the model, and the bodywork has been wrapped in a high-metallic Diamond Blue vinyl by the skilled team at Funkee Fish. The Bruiser’s famous “Hog Heaven” livery and all its other decals have been digitally reproduced by hand, along with a faithful reproduction of distinctive tri-colour stripes that run the length of the body and frame the bonnet. On the tailgate, the TOYOTA name looks as though it has been stamped into the metal, an effect achieved using a special dome gel. The same material was used to simulate the raised black window surrounds on the rear section of the cab. Just like the model, the Hilux Bruiser has a louvred rear window. In fact, it was impossible to install the actual glass, so a two-dimensional print has been used that looks just like the real thing, even at close quarters. 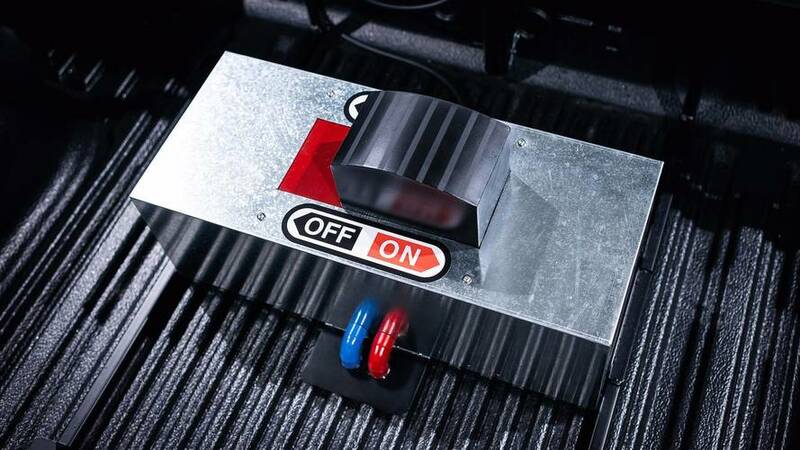 Expert model-maker and fabricator Robert Selway was responsible for recreating some of the details in 1:1 scale, including a (replica) on/off switch in the load bed, R-shape body clips and tubular bumpers and rock sliders. 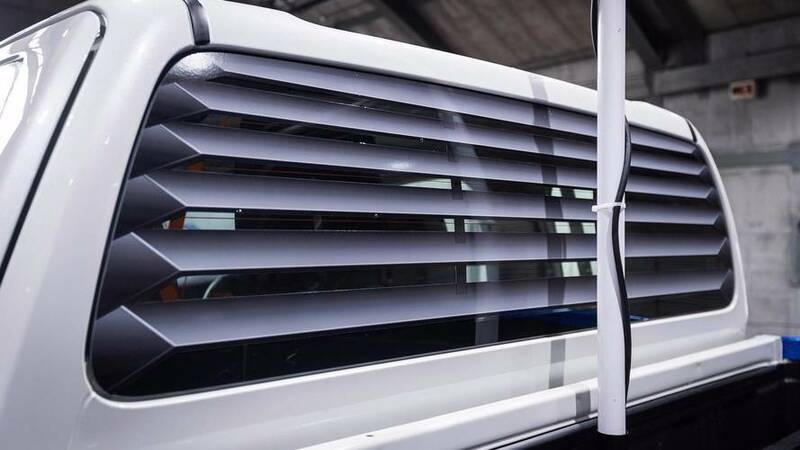 The bonnet clips are magnetic and for show only, while the bumpers and rock sliders have been fabricated from stainless steel exhaust tubing and wrapped in white vinyl to make them look like the model’s plastic parts. In a move away from the Tamiya original, Toyota’s Hilux Bruiser has a large antenna behind the cab, to reinforce the impression of it being a radio-controlled model. 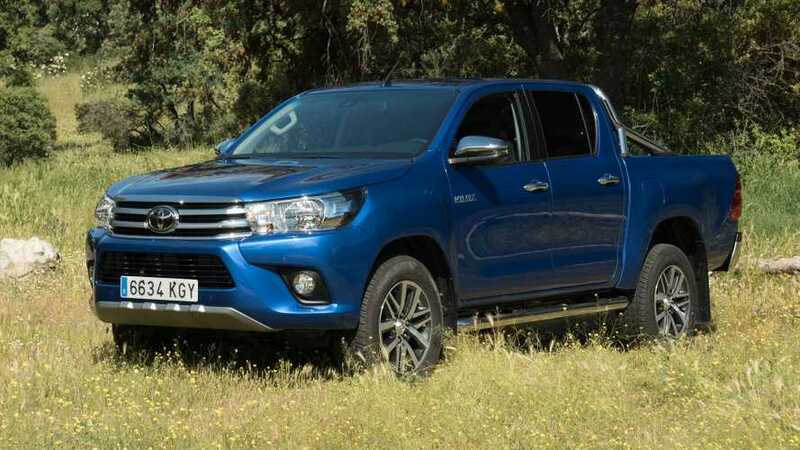 James Clark, Toyota GB Press Relations Manager, said: “While Hilux is all about capability, owners and all fans of pick-ups and big trucks know a big part of the experience is also about having fun. In that spirit, we wanted to do something truly original to celebrate the latest Hilux and carry forward the great relationship we have with Tamiya. The Hilux Bruiser is powered by a standard 148bhp four-cylinder turbodiesel engine, with all-wheel drive through a six-speed manual transmission. It is street legal and will be joining Toyota’s fleet for use by media and appearances at events around the country.